Juan Campos' military career began on September 21, 1953 with Company B, 4th Armored Reconnaissance Battalion, 144th Infantry, 49th Armored Division. He was mobilized with the 49th Armored Division on October 15, 1961 and remained on active duty until August 19,1962. He began his full-time service on November 1, 1965 in Raymondville and served with that unit until he transferred to Brownsville on September 2, 1968. His leadership and professional competence contributed significantly to the unit's receipt of the Eisenhower Trophy for two consecutive years. 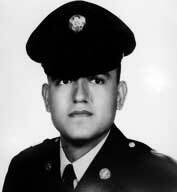 Sergeant Campos served as a member of Company A, 3d Battalion, 141st Infantry, until his death on August 22, 1980. Sergeant Campos' personal qualities, leadership skills and overall professional performance were particularly outstanding, both while operating with troops in the field and in garrison. He continuously undertook the most difficult of tasks and consistently brought them to a highly successful conclusion. He demonstrated exceptional pride in his profession while leading the troops in his charge. This professionalism was noted both on and off duty. His stamina and judgment made him extremely valuable asset to his unit and the Army National Guard as a whole. Very active in community work, particularly the Kiwanis Club and the Daybreakers of Brownsville, he served often as an officer and a club leader. He also functioned as a liaison with the Brownsville Chamber of Commerce for the Texas National Guard.